LAKE MICHIGAN IS one of the five original Great Lakes, which are located near or along the border between the UNITED STATES and CANADA; a sixth lake, Lake Champlain, was added to the Great Lakes category in 1998. The Great Lakes are the largest group of freshwater lakes in the world, and Lake Michigan is the only one located entirely within the United States; its waters are contained within the states of INDIANA, ILLINOIS, WISCONSIN, and MICHIGAN. This body of water is 22,300 square mi (57,800 square km). It has the third-largest surface area of the Great Lakes, and is the sixth largest lake in the world. It connects to Lake HURON through the Straits of Mackinac and the two lakes are, hydrologically speaking, inseparable. The lake’s drainage basin, the area of land where streams and rivers that drain into the lake exist, nearly doubles the lake’s scope at 45,600 square mi (118,000 square km). Rivers such as the Fox-Wolf, Grand, Kalamazoo, Menonimee, Muskegon, and Saint Joseph are among the most notable. Via the Chicago River, Lake Michigan also connects to the MISSISSIPPI RIVER basin and then the Gulf of Mexico. Lake Michigan is 307 mi (494 km) long and 118 mi (190 km) wide, with an average depth of 279 ft (85 m and a maximum depth of 925 ft (282 m). It contains 1,180 cubic mi (4,920 cubic km) of water, and averages 577 ft (176 m) above sea level. The shoreline is 1,638 mi (2,633 km) long when its island shorelines are considered. The Great Lakes formed slowly; 600 million years ago, a shallow sea covered the area, and sand and silt deposited there gradually compressed into limestone, sandstone, and shale. The sea eventually dried up and about 1 million years ago, thick glaciers advanced and retreated over the land, carving large holes in soft sandstone and shale. Approximately 10,000 years ago, the last glacier retreated. As the Earth warmed up, the resulting water, called meltwater, filled the holes carved out of sandstone, and the Great Lakes were formed. The Sleeping Bear Sand Dunes, a spectacular feat of nature located in a national park, hovers 465 ft (142 m) above Lake Michigan and extends 35 mi (60 km) along its eastern shoreline. At this site, visitors can observe windswept dunes and other glacial formations. A wide variety of fish live in Lake Michigan, including salmon, perch, bass, and walleye. Trout and whitefish are especially prized. By the late 1950s, many fish had been killed by an eellike creature called sea lamprey; although that problem has been alleviated, another greater problem still exists: pollution. Lake Michigan’s waters have been polluted from sewage and industrial waste, in part because its large surface area is a ready target for toxins falling from the atmosphere. 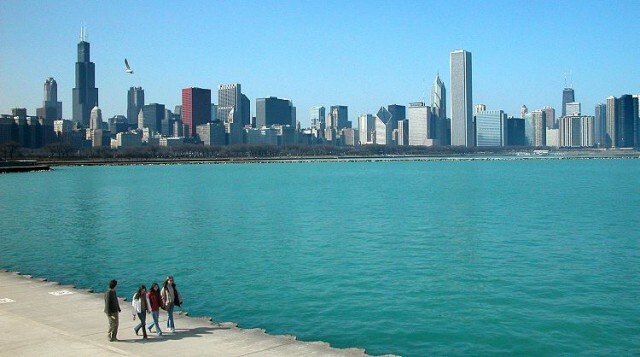 At one time, Chicago’s waste was dumped into the Chicago River, which flowed directly into Lake Michigan, and many other towns also dumped their raw sewage into the lake. Lake Michigan has a retention time of 99 years, which means that a molecule of water that enters the lake will, on average, take 99 years to leave its confines. Clearly, then, the contaminants entering the lake were accumulating; aggravating the problem was the fact that Lake Michigan was a closed ecological system. Although many rivers flowed into the lake, none flowed out. To alleviate the pollution problem, engineers reconfigured the course of the Chicago River in 1900 so that it actually flowed away from the lake, thereby reducing the surge of sewage and chemical waste into Lake Michigan. Stricter environmental laws have also reduced the amount of industrial pollutants entering the water. In 1990, Congress passed the Great Lakes Critical Programs Act, which mandated more programs to reduce toxic pollutants so that Lake Michigan and other Great Lakes can be restored to a more healthful and stable condition.